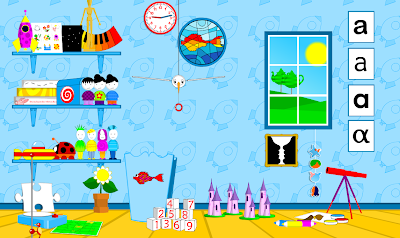 A friend turned me onto this very cute website, she said that her son loves to play on 'poisson rouge' and I found it delightful! As you click through you will find that the surprises are unending! I think it's very simply beautiful... and I think your kids will love the songs, sounds and colorful sweetness of this website. Take a look and be surprised! A very smart woman had an idea, it was a very simple idea but a very good idea. Elizabeth Scharpf started SHE after a study she conducted found that girls and adult women are absent from school and work in developing countries up to 50 days a year simply because they lack access to affordable sanitary pads. That's 50 whole days of desperately-needed education and wages lost every year for a reason so unnecessary it boggles the mind. Elizabeth decided to do something about it. But she's not donating sanitary supplies. Instead she's helping women in developing countries start their own businesses manufacturing sanitary pads from banana fibers (a renewable resource) and selling them at an affordable price to women in their communities. 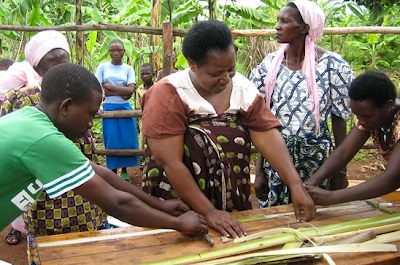 Her approach creates a sustainable local supply for these necessities while providing new and lasting economic opportunities for women trying to lift their families up out of poverty. SHE provides the training and seed money. The women who own these new micro-enterprises take it from there, and everybody wins: for every new SHE business established, 100 jobs are created and 100,000 women gain access to affordable sanitary pads. It's simple and it works. Visit the SHE website to find out more about what you can do to help... but I think that this can also spark other ideas that are equally simple yet so necessary. See what you can do to help. I heard about this initiative via the Seventh Generation website, they always have terrific news so check it out and buy their products!! Thank you Seventh Generation for keeping us informed on GOOD news! Nonchalant Mom NYC tour (soho and nolita) I visit NYC as often as I can and no matter what I do I always end up spending a day on this route so I thought it would be a good idea to share it. This is a great route if you drive, I used to always find street parking, but after a few tickets (thank you Bloomberg) I now park in the garage, but the garage I give you below on Kenmare is really the best! (and cheapest). I realized that many of my places include food... hhhmmm.. but you need sustenance for all that shopping! 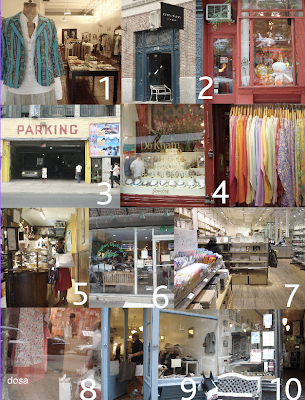 1) Erica Tanov - her store is so inspiring, I always love to spend some time here. Her jewelry is really out of this world and she inspired me to carry more jewelry in Nonchalant Mom. Her kids section is priceless! I always pick up something for the kids here even if it's just a little paint set! (Elizabeth btwn Prince and Spring). 3) This is the Kenmare parking lot (between Mulberry and Mott). The location is good and its cheap. 6) Hampton Chutney Company - This is a great place for a real authentic Indian lunch, I go for the Chai or Cardamom Coffee, you will never drink Chai from anyone else (ecept in India!) again, period! I never miss this place on a trip to NYC (I even make my husband go and get me a Chai to bring back to Rhode Island). (on Prince btwn Crosby and Layfayette). When you come out the door walk straight across the street to 'Paula Rubenstein' her shop is the best for amazing curiosities, she has inspried so many things in our home, you can spend hours looking in all the drawers and through fabric here. now you have to walk all the way over to the other side of Soho--to Thompson St.
10) Snack - Finish your day with an amazing Greek meal at Snack, it's so fresh and delicious! Try everything! I always like the chicken borecki (I can't really spell that but it tastes so good!). (Thompson btwn Prince and Spring) Have fun and make a day of it!! 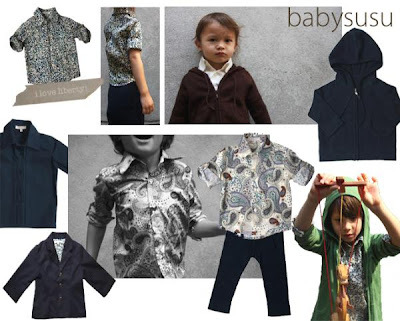 baby susu - for boys! Finding great things for boys is not always easy, and somehow I have this aversion to the typical boys things like mini boden, it's just too practical and sporty... But today I got an email from the people at baby susu and I think they are great! (and yes, you may see them on nonchalant mom soon... you never know...). Classic and beautiful liberty print shirts (always love that!) 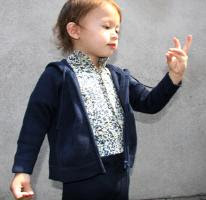 great simple pants and wonderful sweaters.. finshed... that's all you need for boys! (Oh, and maybe a lucky fish t-shirt or two). I must add a plug in for myself here otherwise, well I suppose it's just not good business but this Spring 2010 I kept the boys in mind a bit more than usual and as a result we will have some great boys things from TUSS, Makié and Nico Nico... (all arriving in February) and then a few more surprises. But in the meantime get some goodies from Baby Susu! click here to visit baby susu - they are on sale at the moment. Just in case you missed it, Meryl Streep is wearing a few matta items in the movie It's Complicated - She wears the Dupatta Shawl in many shots and then she also totes this wonderful Matta bag... yes, I have it! but in a different color, but I must say that it looks oh-so-chic! The Amrita dots bag - which is on sale for $120! The Dupatta shawl, which I have a quite a few colors and more colors are coming for Spring in Feb/March! They are a favorite and a perfect piece for Spring! fast is over... 4 days! I finished my fast on Friday and my husband talked me into doing the salt water flush as well... interesting... but I am glad that I did it. I have to say that this is something that I thought I would never do, but it was so incredibly easy! When you set your mind to it and just do it! I felt great throughout, no problems at all. I didn't take on any big tasks (just packing some boxes.. ha!) and I think that helped, I gave myself the room to relax if I needed to and just take some walks in the woods, it's important to keep your stress level low ...if you can find that time. 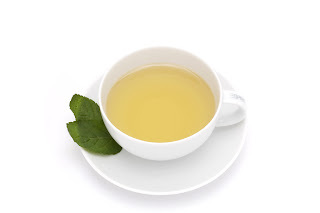 The fourth day was good and I still didn't feel hungry, the tea is really good enough. If you want to do the salt water flush it's on the 'master cleanse' website, it gives a great description of how the process works and it basically cleans you out! 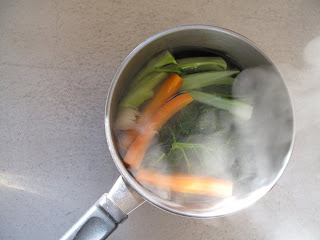 On my fifth day I just has some grapes and I made this wonderful broth from vegetables and a piece of garlic, which was SO good I will make it my breakfast drink from now on! delicious! I realized that I actually went a 5 days without food yes, but also, coffee or sugar so I am going to do my best to give them up! ...so there! Today, which is my sixth day I had the vegetable broth for breakfast an amazing oatmeal for lunch, and then my homemade chicken soup for dinner. I would fully suggest a fast to anyone! I would probably do it again in the summer because I was kind of cold at night... you have a hard time keeping yourself warm. But my eyes are clear, you won't believe how clear they get! and I am ready to GO! Good Luck and I hope that you try it.. if you do, send us a comment! Maybe it's because I was looking for it or I was interested in it, but most likely it's because it's January! January is a perfect month to do a fast, kind of a new year thing to start a-new! Everywhere I went people were fasting.. or talking about fasting and there I was with my big ear listening in on it. Honestly, in my life I have never completed a fast, two years ago I tried to do it with my friend Karen and we had a few false starts and then on the day we got ourselves together she said "okay, is this going to be a 3-day fast of 5-days" and I yelled out ARE YOU KIDDING 5 DAYS! It was over for me at that moment. This year, I did a bit of research and yes, most fasts are from 3 - 10 days--hol-y cow! Then I just decided to jump in and do it. I am on day three and I have to say it's been really refreshing and no where near as hard as I had imagined. Yes, I was hungry the first day but not really anymore. I am mostly looking for something to do... after I drop the kids off at school (coffee + 'something'), at lunch I just kind of pace around, and dinner... I would say it's a bit difficult to make your kids a tasty dinner and then just sit there while they eat it. But it's all going fine! (tonight my kids are eating at my neighbors house!). My husband joined in with me yesterday so that made it a bit more fun, someone to talk to about missing food. Today (day three) I feel very alive and awake, my eyes look so clear it's amazing! and I'm feeling really good. It has broken down a bit like this - day 1: a bit hungry but the tea is wonderful. day 2: headache. day 3: I feel clear and really good. now I can't wait for day 4! That will be it, we will come out of it over the weekend. There are so many religions that involve a fast and I can see why it's important in strengthening both your body and your mind. Coming out of a fast is a bit tricky as well... we are going to do fruit and as I believe in apples I think that's what will happen (although I have heard a lot of good things about grapes! ), then brown rice for two days and then we will see how we feel. My friend in Switzerland suggests that the tea "smooth moves" will help you to eliminate as well, but since this is my first time (and I can already tell it will not be my last!) maybe next time. We will keep you updated on how it's going... stay tuned! I made a big purchase from the Kushi store last week and when the box arrived I just couldn't wait to start eating good food! So I wanted to share tonight's dinner with you and I hope it will inspire you to eat well! BROWN RICE - I bought 'freshly hulled' brown rice from the kushi store and it's delicious! I cooked it with one umeboshi plum (so no salt) and a piece of kombu (when it's finished cooking you can take out the kombu and chop it up and put it back in.. nobody will notice! and it's super good for you! lot's of minerals!) AND I like to add a bit of the shiso leaves from the umeboshi (that purple stuff at the top of the jar or package). I like leftover rice so for our family of four I cook 1 1/2 cups of rice (wash three times) in three cups of water, one umeboshi plum, a 1"x 1" piece of kombu and some shiso leaves, cover and cook for about 40-45 minutes on very low flame. When it looks like the water is almost gone take off flame and let sit for a few minutes --perfect every time! KINPIRA (traditional Japanese side dish) - sauteed burdock root and carrot - I used dried burdock root (burdock root is very good for cleaning your blood) that I bought from the Kushi store as a shortcut (I used half the bag), otherwise you have to clean and peel fresh burdock root and cut into matchsticks. Cut carrot into matchsticks. 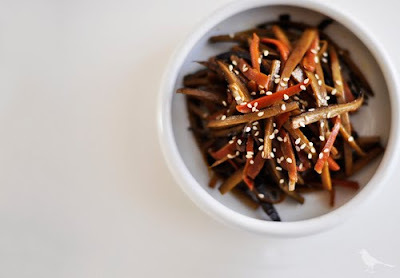 saute burdock root in sesame oil for 10 - 15 minutes covered (medium low flame) if pan gets dry use some water after it's sauteed a bit add 1 tablespoon of Mirin and cover again. Add carrots and a tablespoon of Mirin and Tamari to taste and saute again covered for a few minutes. I forgot to take a photograph of our finished meal... but I did find the beautiful photo at the top from a lovely blog called m+d - click here to visit and enjoy! click here to visit the Kushi store and shop for yourself! ... and anything else that sounds good to you!!! Sometime I think that all you need is a little 'push' to get you into sewing... and a new baby is a GREAT instigator! If you start when you are pregnant it will give you such satisfaction for those nesting moments (or days, weeks or months!). When those creative juices go into overdrive and the 'nursery' is done (or you just skipped that part) it will be really fun to start on CLOTHES! I tell you, there is nothing more fun than putting your kids into something that you have made, yourself! With this book from Lotta Jansdotter you will be inspired to sit yourself down in front of the sewing machine and make your baby some wonderful things! Once you get started you will be making play clothes for your kids in no-time! 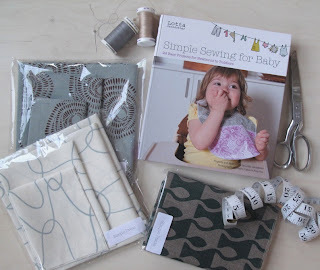 As an added 'push' Lotta is offering this great kit of fabric with the purchase of a book for FREE! (offer ends on January 21st 2010). Don't miss this offer and you will be able to make some great kids clothing with amazing Lotta prints! Have fun and keep it up, if something doesn't work, just learn from it and keep on going!! click here for book offer! You would be hard pressed to find a place struggling worse than Haiti, even at the best of times. 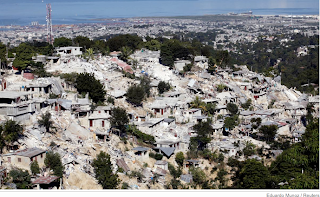 Trying to emerge from social and political turmoils that have embroiled it for years and a recent hardship caused by 4 major hurricane hits, the last thing Haiti needed was a Major Earthquake right underneath it. As word of the devastation first started reaching the world it was easy to be mired in conflicting reports and general confusion. But, shortly thereafter, the catastrophe really started to come into view with the flood of images coming out of the capital city Port-au-Prince. Personally, our family does not have any direct connection to the Caribbean nation. But the images easily conveyed the same confusion, pain, fear, and suffering that I remember clearly from the 9/11 tragedy. Of course, anyone who has seen such a thing doesn't forget it easily. For us, it does not matter if the tragedy is man made or a natural occurrence - it is still just that: a tragedy. You want to do something, you want to react..... but in this case, you can't. You feel frustrated, especially when we see the faces of the frightened and bewildered children. Some things are just overwhelming. So, if like us, you want to do something - then please give a little something to one of the many organizations that have reacted quickly to this disaster. We have given to an organization that we have long admired called Partners In Health who are well place to help in this situation. 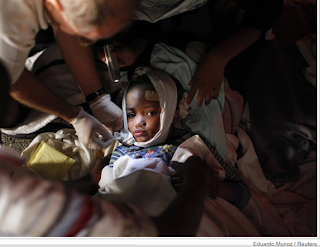 But, honestly, you can choose from many organizations such as the International Red Cross. We hope you will consider it as a matter of urgency. 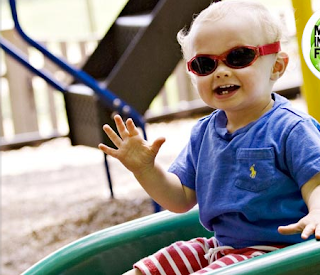 I have been asked a few times about sunglasses for kids and where to get them. I just heard from this company called 'Real Kids Shades' who make really nice sunglasses just for kids. 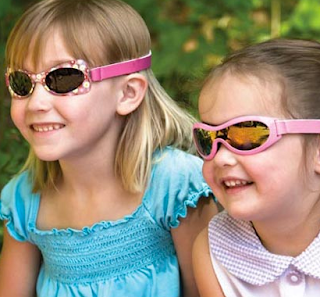 They look great and protect your kids eyes from harmful sun rays. It's easy to get your kids to wear sunglasses in the summertime but in the winter the glare off the snow can be really intense at times (and even more harmful). These glasses protect 100% against UVA and UVB. Reading through their website you will find some eyeopening (pardon the pun) facts like: "90% of total lifetime damage from the sun's harmful rays occurs by age 18"... yikes! These glasses looks great and tough and made for kids and don't worry they won't break your bank (from $14.99-$19.99)--it's certainly worth a try! 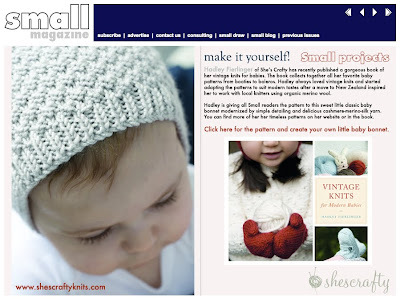 I thought this was great that Small Magazine provided a pattern for this baby cap (click here). A friend of mine made it (well a customer did) and it turned out super cute so I wanted to share it with everyone. This cap is a good way to get started on knitting, not only because its easy and an easy stitch but it won't take you long and before you know it you will have a sweet little cap for your little loved one. The pattern is provided by Hadley Fierlinger who has a book out called "Vintage Knits for Modern Babies". But you can get this pattern free by downloading it from Small Magazine. I think that one of the most difficult things is to find really nice yarn, and now you can buy really beautiful yarns online and it's so easy. I really like to buy from Purl (the store is in Soho on Sullivan Street) I actually just like to go to the store for inspiration on color and they also have a fabric store that is really fun... But they are very nice and can even help you to get started on your pattern if you are first time knitter. pssst... we went away for a week and I don't think that anybody noticed... Julie worked feverishly on sending out orders and lots of them due to the sale! We are running dangerously low on stock and just waiting for new Spring 2010 to arrive (only Makié and Matta had themselves together to ship in 2009!) so it was as good a time as any to ditch out for a bit and take a mini-vacation with the kids to--none other than--Disney World! (and yes, we will come out with a little travel guide on the subject very soon). 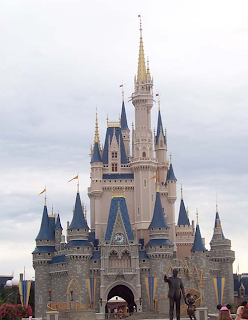 It was a kids vacation, but we managed to slide in a bit of adult time as well, and we will show you how you can do this on a Disney World vacation for yourselves in a blog in the coming week. Our time away gave me a moment to re-group and think about goals for the coming year, for some of you this may be a chore but I really relish this time. In our busy lives, when one day kind of blends into the next, it's important to have a break in the day-to-day and take your mind off of kids lunches and laundry to see what you can conjure up for the coming year, let your mind really explore new ideas and what is possible and even think about going for the IMPOSSIBLE (it's important to at least think about it!). That time away can be just a day or even a few hours but just think about yourself for a moment and what you want. Obviously, this exercise should happen more than just once a year, but make sure it's AT LEAST once a year! If you want, take a moment to make a comment on your goals for the year, it can be anonymous if you want but it may give more power to the idea if you write it down AND it helps others to see other peoples goals, be they big or small! News arrived today of the passing of the creator of those endearing bendable figures known widely as 'Gumby and Pokey'. It is amazing to be reminded that Art Clokey created these characters (with his wife Ruth) almost 60 years ago now - apparently creating them near the end of his studies at USC for a student project, then debuting the idea on none other than the 'Howdy Doody Show' (how's that for giving you a sense of time!). I must admit to you that without Gumby I might not have survived my earliest childhood. Gumby was surreal enough to my 4 year old mind to make perfect sense in my convoluted household. His continued optimism throughout his journeys and experiences with his sidekick Pokey helped me endure when otherwise things might have been very fuzzy for this four year old. And, who can ever forget that first taste of pure 'evil' imagined in the form of the 'Blockheads' - creating havoc wherever they happened to follow! It is also worth noting that Mr Clokey also later created the stop-motion duo called Davey and Goliath - each episode packed with an incredible moral lesson. For some reason, I will never be able to forget Goliath's voice when he would call out Davey's name ..... 'Dayyyyy iii veeee'. I also seem to remember, unlike Gumby, that Davey and Goliath would come on the television very very early in the morning. lukcy fish - lots of size 2 left! I don't know how it happened but there are a bunch of size 2's left from Lucky Fish... If you have ever been to my store you would see that I put everything in 'bins' to keep them tidy and clean and I keep things by size, well my size 2 Lucky Fish bin is totally full while all of the other sizes are practically empty! I hope that this all makes sense and take advantage of the size 2's!!! I wore this shawl collar cardigan all over florida on our recent trip... it's hard to see on a flat photo but it's such a great piece! I like the white with pink "mi amor" on the back... and the style is just perfect for travelling!